What type of travel photographer are you? Perhaps you pack your iPhone and charger into your purse and call it good, or maybe you’ve got a heavy bag full of lenses and tripods for those just-in-case photo opportunities that always see to present themselves when you’re not prepared. This travel photography gear list is for every type of traveler and includes our top camera accessory picks from the past year. Below you’ll find stylish camera bags, rugged portable hard drives, and an awesome hands-free camera clip. 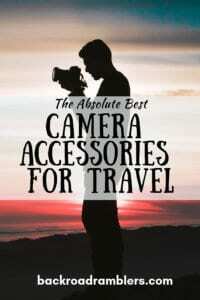 All of the items listed make fabulous gifts for travel photographers, bloggers, and camera-wielding adventurers. We’re not including cameras or lenses in this post. 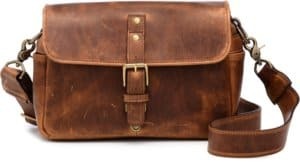 We’ve come across some awesome camera bags this year. A few we have been lucky enough to add to our travel photography kit, and others we’ve added to our wish list. Here are our top picks for the best camera bags for travelers. The Evecase Urban Life PU Messenger Camera Bag. If you’re looking for a compact camera bag for travel, we recommend the Evecase Urban Life PU Messenger Camera Bag. The bag is small and lightweight, but big enough to hold your DSLR, two lenses, plus your phone and wallet. This bag is water resistant, comes with adjustable inserts, and a luggage slot for attaching to the handle of your suitcase. The Evecase bag is small enough to be considered a personal item on an airplane and will easily fit under your seat. We love the vintage look and the affordable price. If you’re planning a trip that revolves around photography, one where you’re packing several camera bodies, lenses, filters, chargers, and a tripod, we definitely recommend the new Xpedition Backpack: Photography Set by Bagsmart. This unique bag features several modular components with magnetic elements to lock each component in place and provide perfect weight distribution for less back strain and easier traveling. The photography set comes with the main bag, which is padded and waterproof, features an internal X-frame to keep the weight distributed evenly, and a secret compartment for your laptop or tablet. The photography set comes with two padded camera cubes that attach to the main bag via the magnetic elements, as well as a small sling bag for small accessories. We originally thought this bag was a bit heavy, but because the weight is distributed evenly across the back, we quickly realized how much more comfortable it is for travel. We’ve lugged ours through the airport, on hiking trips, and through the streets of Philadelphia, and we love it. The Xpedition Camera Bag is currently available for backing on Kickstarter. For weekend trips, we like to carry a small-ish backpack that has room for a single camera body, a few lenses, our laptop, and some extra gear or accessories. 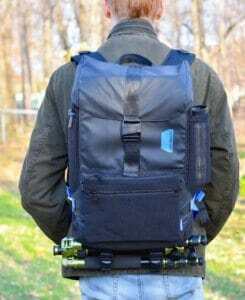 Our requirements are that it must have a hip belt and sternum straps for hiking, side access for getting out the camera on the fly, and external straps to carry a tripod. The Thule Aspect DSLR Camera Backpack fits the bill perfectly, and we like that it doesn’t look like a camera bag, just a regular backpack. The Thule camera backpack has customizable, padded storage for your camera and lenses, a padded laptop sleeve, and room for lots of extra gear. It easily works as a carry-on and will even fit under most airplane seats. I can’t remember anyone ever accusing me of being stylish, but a girl can dream, right? I am currently in love with all ONA bags and am obsessively coveting the ONA Bowery Waxed Canvas Camera Bag. The leather one is nice too. This beautiful bag has room for your DSLR, a few lenses, and some extra accessories. It comes with a removable strap and is made with beautiful leather accents and antique brass hardware. The padded camera insert is removable, so the Bowery bag can also be used as a stylish travel purse. Now, onto the little things. We like to keep it fairly simple when we travel, but there are a few things we never leave home without. 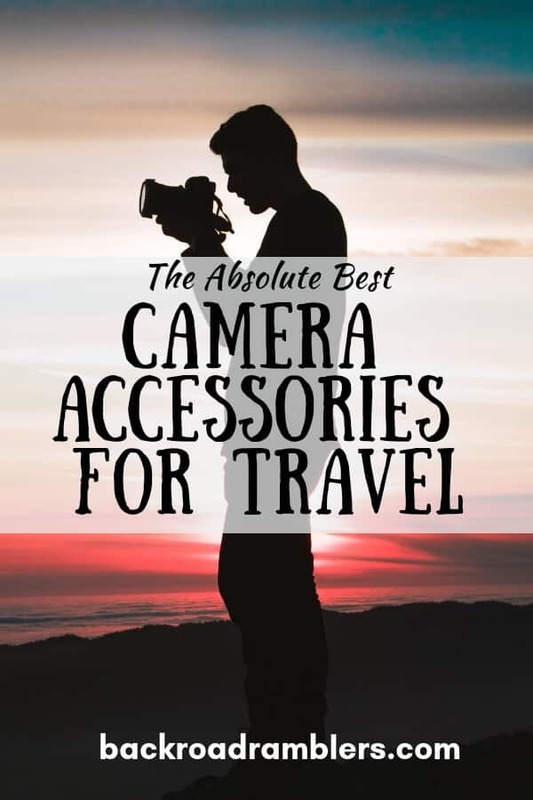 Here are some of our favorite camera accessories for travel. We bought a new tripod this year after our ancient, heavy beast rolled down a mountain. A friend recommended the MeFOTO Classic Aluminum Globetrotter Tripod, and after tons of research, we decided to go with it. The MeFOTO tripod comes with a quick-release plate, twist-lock legs with spiked feet, and a height range of 16”-64”. We love that it comes with a detachable monopod and only weighs 4.6 lbs. This is a very heavy-duty tripod that packs up small for easy transport. We’ve really loved using it so far. Sirui T-005KX 52″ Aluminum Alloy Tripod. We thought we would be able to use the meFOTO tripod mentioned above for hiking, but the truth is that our camera equipment is so heavy without the tripod, that we were rarely packing it, and our photography was suffering. We decided to get a cheaper, lightweight tripod for hiking, and settled on the Sirui T-005KX 52″ Aluminum Alloy Tripod. The Sirui tripod is 1.9 lbs. and can hold up to 8.8 lbs. It’s pretty rugged for its weight, but I would definitely suggest stabilizing it in the field with a backpack or something. It folds down to 12’’, which fits pretty easily into a daypack. Now if we could lighten up the rest of our camera gear, we’d be all set. The innovative Peak Design Capture Camera Clip has been around for a few years now, and it’s definitely one of our favorite little camera accessories. 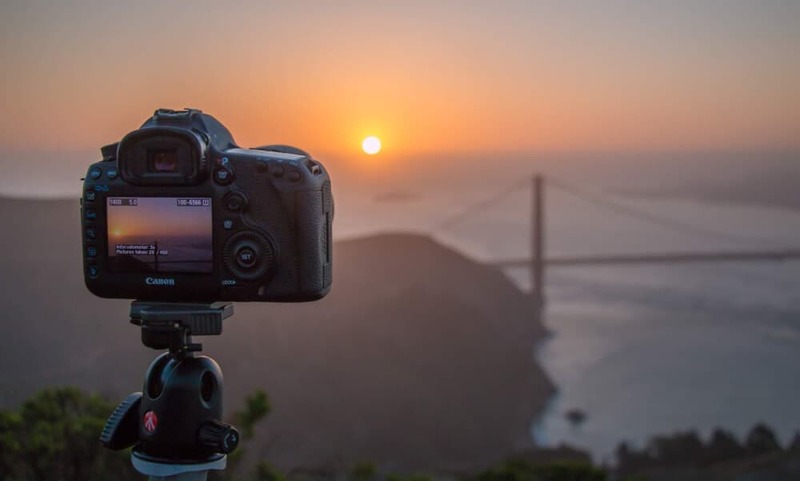 The Capture Camera Clip enables you to securely clip your camera to the front strap of your backpack so that it is instantly accessible when you’re ready to take a photo. So much better than having to dig it out of your bag or having it swing from your neck while hiking. When not in use your camera locks securely into the clip using a tripod-compatible plate. I’m in the market for a new camera strap, as the one I’m using has definitely seen better days. So, the strap that I’m eying, the TETHER Camera Strap, is a 30” polyester strap with genuine leather ends. Generally, I’m not a fan of polyester, but my current strap is cotton and it just isn’t durable, and it’s impossible to clean. TETHER has a bunch of different styles and colors to choose from, but the one above is my favorite. I have a love/hate relationship with the selfie, but I do a lot of solo travel, so I’ve managed to get over it, and have been practicing my best poses. I still don’t do many true selfies. Instead, I set up my tripod, and use the Pluto Trigger on time lapse to take a photo every second for 30 seconds. The Pluto Trigger works via blue tooth with your smartphone or tablet once you install the app. It has an amazing array of features, including voice activation, a motion sensor, a light sensor, and a laser sensor. I still haven’t explored all of the cool features, but I’m really happy with the ones I’ve used. Check out Pluto Trigger’s Instagram account for an idea of what people are using it for. I can’t wait to experiment more with it this winter. Yeah, tripods and triggers are great for serious photography, but unless you have no intention of appearing in any of your photos, there’s still a place for selfie sticks in your photography kit. The Yoozon Selfie Stick weighs just four ounces, connects to your phone with a blue tooth trigger, and extends to 26.6”. The best part is that this tiny, portable stick has folding legs to go from selfie stick to tripod in about two seconds. Very handy for backpackers, vloggers, and of course, selfies. We’ve just started experimenting with clip-on phone lenses, and have had mixed results so far. On the one hand, we love the versatility of an added lens for smartphone photography, but on the other hand, you definitely get what you pay for. If we want something expensive and professional, we might as well shoot with our DSLR. What external lens you buy for your smartphone will depend entirely on your situation. If you’ve got a high-quality smartphone camera and use it for most of your photography, I say splurge on the best, which is definitely the Moment lens series. They are the made of the highest quality glass, and nothing else comes even close. If you use a mix of photography equipment, which sometimes includes shooting with your smartphone, you can skimp a bit on quality and price. I’d go with the Olloclip Lens System, which still takes pretty good photos, and comes in fisheye, wide angle, and macro. Don’t bother with the cheap knock-offs, as you will find it impossible to get a decent shot. I speak from experience. Peak Design Black Form-Fitting Rain and Dust Cover. For years and years, I avoided bringing my camera out in rain and snow, and I missed out on so many beautiful opportunities. Last year, I decided to get serious about protecting my camera in nasty weather so I could capture snow and rain storms. I still need lots of practice, but things are easier now, thanks to the Peak Design Black Form-Fitting Rain and Dust Cover. This stretchy cover allows you to access your viewfinder and controls without removing it. It cinches completely closed when you’re not using your camera, and it works with the hands-free camera clip mentioned above. I use both the camera cover and the clip for cross-country ski or snowshoe days, and my winter photography is finally improving! Portable chargers aren’t strictly necessary for travel photography. I always carry two extra batteries, and so far, I have never gone through all three during a photo shoot. The only exception has been during a day of shooting that involved lots of long exposure shots and video, and when we’re camping. 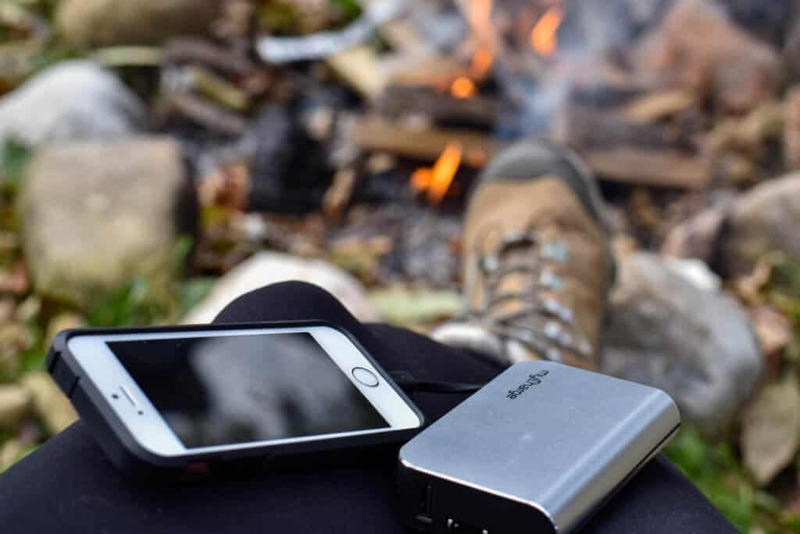 On camping trips, I always bring the MyCharge HubPlus portable charger, which comes with built-in lightning and micro USB cables, a folding wall-prong, and 6,700 mAh for 4 times more battery power. I charge it up before a weekend trip and can use it to charge my camera batteries 4 times, and my phone at least twice. ADATA HD710 Pro 4TB Ruggedized External Hard Drive. If you’re anything like me, you take photo storage seriously. In addition to serious storage on my laptop, I use cloud storage and two external hard drives. One I keep at home, and the other comes with me on trips. My travel hard drive is the ADATA HD710 Pro 4TB Ruggedized External Hard Drive. It gives me plenty of space for all my photos and videos, transfers data super quickly, and is shockproof, waterproof, and dustproof for all of our outdoor adventures. These are available in 1 TB – 4 TB capacities and they come in different colors. This hard drive has been awesome so far, but I still do a second back up when I get home, just in case. 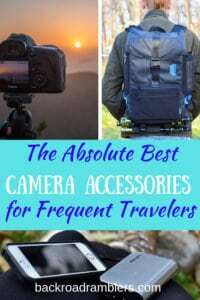 While I wouldn’t consider myself much of a shopper, I love finding the perfect travel photography gear for my outdoor adventures. Having the right equipment makes it much easier to get outside with my camera, and when it comes down to it, that’s what really matters. Do you have any favorite camera gear that you can’t live without? Do tell – I’d love to know what I’m missing!